It is often a challenge to get students involved in a discussion or an exercise by starting with a ‘blank canvas’. Therefore, this teaching method has been used to facilitate better and deeper discussions and to get beyond simple top-level responses. The integration of various marketing concepts can be a difficult task, usually only mastered by students later in their university degrees or in a postgraduate program. Most undergraduate marketing students are still learning the core concepts and theories. Therefore, the goal of most of these learning exercises is to reinforce a specific marketing model or piece of theory. All these exercises are designed to be addressed relatively quickly. Students should be to review the instructions and read the background information in five minutes or less, and then start the activity. Clearly that means more efficient use of lecture and class time and greater student involvement. Hypothetical case studies force the students to think through the marketing situation presented, as they have no other reference point. Probably you have faced the situation of using a case study that is based on a real firm. If it is an assignment, then many students will research the firm to see what they actually did and what the outcomes were. And when the case study is used as a class discussion exercise, there always seems to be one or two students who know more about the firm or what the firm did. These students often take the role of ‘expert’ and overly dominate the discussion. Therefore, with hypothetical marketing case studies, all students can address the exercise on an equal basis and further internet research will not help them. There are plenty of long marketing case studies already available. Virtually all marketing textbooks provide a number of case studies and they are also readily available from online sources. 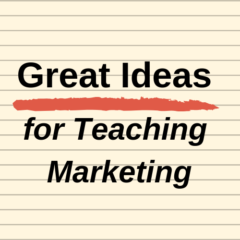 Therefore, as this style of marketing teaching activity is already well catered for, there is no need to duplicate it to any significant extent. The questions in the exercises are based on the information presented in the activity itself as well as being based upon the relevant marketing theory. The questions provided range in complexity, from relatively straightforward (to simply get the students engaged) to quite challenging (to get the students to assess and critically examine the marketing scenario.